This recipe goes out to all of you rad parents with kiddos heading back to school this week. You asked for quick and easy recipes in our recent reader survey here. And let me tell you, this one’s a keeper. If you were a child of the 80’s like me, you can even pop it in your Trapper Keeper to hold onto for busy school nights ahead. 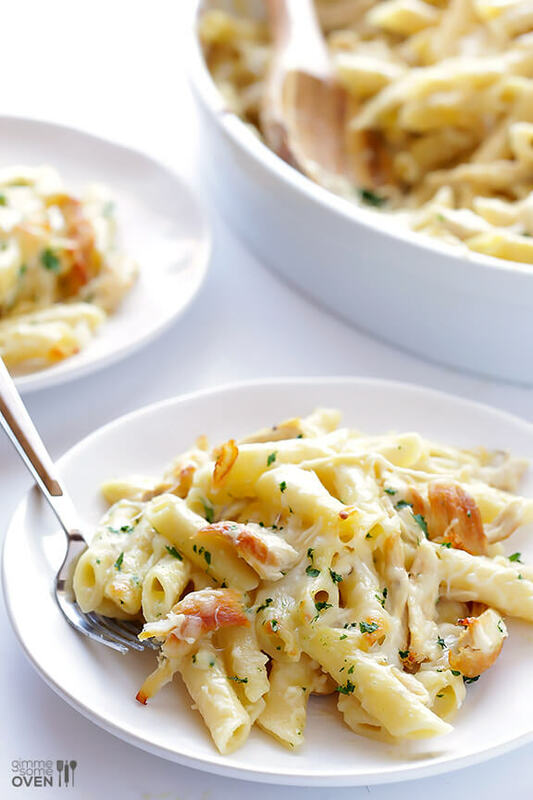 Delicious chicken and ziti are tossed with a lighter alfredo sauce and baked up to cheesy perfection. *This isn’t a super-saucy dish, so if you like a lot of sauce, you might want to consider doubling this recipe. If you don’t have the time to make your own sauce, one standard-sized jar should be enough. Pour half of the pasta into a greased baking dish (either an oval baking dish, as pictured above, or a 9 x 13-inch baking dish will work). Sprinkle evenly with 1 cup of cheese. Layer the remaining half of the pasta evenly on top. Sprinkle evenly with the remaining 1/2 cup of cheese.